Home › Indian national bird › Black-necked grebe › Horned grebe - Podiceps auritus. The horned grebe (Podiceps auritus) is a member of the grebe family, Podicipedidae. The horned grebe is distributed throughout Europe, America and Asia, including Indian subcontinent. There are two recognized subspecies of these birds, namely, P. a. auritus and P. a. cornutus. These birds are migratory in nature and the Agreement on the Conservation of African-Eurasian Migratory Waterbirds (AEWA), is applied to them. 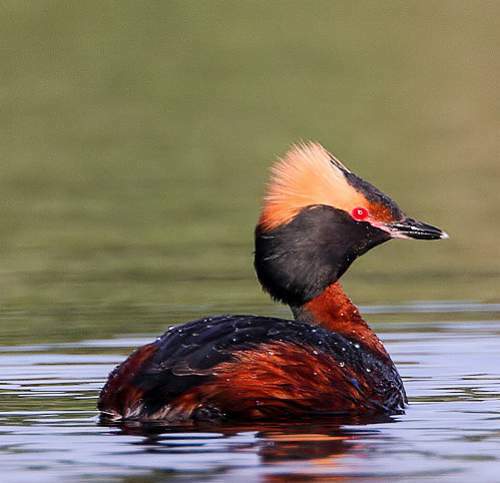 The IUCN (International Union for Conservation of Nature) has categorized and evaluated these horned grebe species and has listed them of "least concern". The horned grebe is a small bird, measuring 30-40 cm in length and weighing 300-500 grams. Their breeding plumage includes a blackish cap, hind neck and back. Brown-golden puffy ear like tuft of horns are also seen along the side of the face. These horns can be erected and lowered and are seen only during the breeding season. The neck is chestnut, eyes are scarlet and the bill is straight, stubby and tipped white. These birds breed between April and August, in vegetated lakes and ponds. These birds are monogamous species. As their feet are set far behind, they cannot walk well. They construct their nests near the water edge or as a floating platform. Their nest contains 3-8 eggs. The parent birds are seen carrying the chicks on their back. They dive to catch their prey and feed on fish, aquatic insects, crustaceans, molluscs and worms. Current topic: Horned grebe - Podiceps auritus.